A couple of weeks ago, the Bodleian trainees had a useful training session at the university careers centre. As well as tips for writing CVs and practice interview questions, there was an introduction to LinkedIn – how best to use it, how to make sure you appeared in Google search results and why you shouldn’t link your Twitter account to it if you’re going to post inane comments about sandwiches. Our careers adviser, who was very good, was a fan of LinkedIn, even if it was just in terms of having a professional CV floating around out there online. She made the point that when you’re applying for jobs you have to fiddle around with your CV, removing and adding things in order to tailor it to the specific position you want. The LinkedIn CV can be broader if you want it to be, listing everything you’ve done, as well as skills you have, groups you’re involved in and so on. She wasn’t so keen on the actual social networking aspects of LinkedIn, although she advised us to use it to find other people online if we were jobhunting or trying to find someone to ask for work experience. I came away from the session determined to create a LinkedIn account, especially with the added incentive of cpd23 Thing 6. And I have indeed created one. But so far I’m not very enthusiastic about it! It may be that I haven’t quite grasped its full potential, but it just doesn’t seem as user friendly as some other networks. 1. It just doesn’t look very nice. This may be fussy, but profiles on other networks are a lot more aesthetically pleasing – even my actual hard copy CV looks smarter than a LinkedIn profile. 2. I don’t understand the social code of LinkedIn when it comes to making connections. Unlike Twitter, it seems to be that you are only supposed to ‘connect’ to people if you know them quite well, so therefore the only people I’ve felt comfortable about adding are my colleagues at the library, and a couple of fellow trainees I’ve got to know quite well at conferences. Although they are lovely people, I’m not sure I really need to see their CVs, and if I want to talk to them I can always talk to them on Twitter (or in real life). If anyone else knows the unwritten rules of connecting on LinkedIn, I would be pleased to hear them. 3. I find it a bit scary that LinkedIn knows so many ‘people I may know’, and therefore I imagine I (and my photo) am coming up on other people’s homepages too. As this is the only time I’ve decided to use my real name, I am still slightly uneasy about it. 4. For some reason, it seems to be recommending jobs to me, but not ones that are actually useful. There are plenty of other ways to find useful library and info jobs online – no, I don’t want to be a graduate trainee analyst or a call centre assistant, thank you. Anyway, I have added a few of my colleagues, just to see what happens, and have joined the groups recommended in the cpd23 post. Hopefully I can explore them in the next few days. I’m not 100% convinced I will keep my profile, especially after the recent security breach, but I will give it another chance before I make a decision. I’ve already written about Twitter in a previous post, and it’s probably my favourite online network at the moment. I think this is partly because it’s the one network which has enough library and info people engaged with it to make it a valuable resource. It’s all very well to have forums, but they easily fall out of use if not enough people use them regularly. I like the fact that on Twitter you definitely are allowed to follow people you don’t know, just because they look like interesting librarians, and it is even fine to start a conversation with those people. I have heard about many things on Twitter that I wouldn’t have done otherwise – Libcamp Brunel, CILIP New Professionals Day, CPD23 itself – all things that have really enriched my graduate trainee experience and caused me to become more enthusiastic about librarianship. I have even used Twitter usefully at work today, in order to search for what people are saying about replacements for the Meebo instant messaging widget, which has been bought out and discontinued by Google. Searching for the #Meebo hashtag brought up comments and links to blogs and articles about other IM clients, and I got a couple of replies from other information professionals about their experiences with Meebo replacements, which I can usefully take back to my colleagues. I have to say that not all of Twitter is useful – I have had to unfollow a few people who tweet a lot about their personal lives (this is OK on Facebook, but I find it odd to read so much about the lives of people I’ve never met). But for the most part, I’d give Twitter the top marks for online networking, and will definitely continue to tweet for a while longer. Like most Thing 6 blogs I’ve read, I’ve decided to keep Facebook personal and private. I really appreciate it – I’ve moved so many times that I’ve got friends scattered every which way, and I don’t think I’d keep up with them if I didn’t have Facebook. I’ve had a look at the CILIP page, and other library pages, but I’m not going to use them for networking. While we’re on Facebook though, I think this is a great example of a library page. It’s St Hughs College Library in Oxford, and I think the use of photos and the new timeline format makes it look really smart and professional! As a new graduate trainee in September, the staff development team at the Bodleian recommended that we checked out LIS New Professionals network, and I found the Graduate Trainees forum really interesting – it was the first time I’d heard what was happening in the world of libraries outside of Oxford, and I went to a trainee gathering in London organised through it, where I met a few people that I’m still in touch with, and have seen at other events. There was also a really successful trainee trip to Oxford organised through LISNPN – I showed a large and enthusiastic group of visitors round the Law Library, and I think everyone enjoyed seeing the different Oxford libraries. I haven’t been on LISNPN for a while, and it doesn’t seem to be hugely active, but I explored it a bit for Thing 6, and particularly like the downloadable resources. Anonymous reviews of the MA courses are a really good idea, as well as other good advice. There’s a new thread to discuss the future plans of this year’s cohort of trainees, which I’ve posted in, and am interested to hear other people’s experiences. The jobs and placements section also sounds really useful. Finally, my role at the moment doesn’t involve any teaching, but I know that it’s a skill that more and more academic librarians need, so I look forward to looking at Librarians as Teachers Network at a later date! I’m a little bit behind with CPD23 already, and I blame my own weak will and the weather for it. An important discovery I’ve made is that the more sun we have, the less interest I have in social media of all forms. Luckily (and this relates to Thing 4 – Twitter) it doesn’t actually matter if you miss out on a few days of Twitter – there will still be a lovely stream of information drifting by when you get back, and you can often catch up on the more important things through retweets and blog posts. However, English weather has reasserted itself in full form, and as I’m trying at all costs to avoid any mention of our beloved monarch on her special day, here I am trying to catch up! 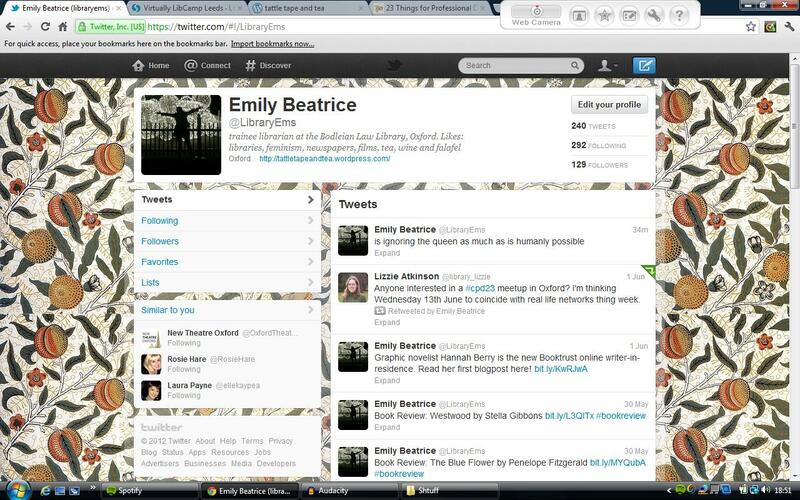 I’d heard of Twitter a long time before I decided to create an account for myself. Like a lot of people, I couldn’t really see the point of it – not that I didn’t like to update people on the inane details of my life/ opinions on certain Daily Mail writers, but that was what Facebook was for. It was only when I started investigating graduate traineeships that I realised how useful Twitter could be as a professional tool. I joined in July last year, and tweeted my pleasure that Brighton and Hove Jubilee Library had opened a cafe (something I am still pleased about, even though I have moved away from Brighton – it is an awesome public library). At that time, I was really only tweeting to an audience of one – my cousin Douglas, who is not a librarian but tweets very entertainingly about theatrical goings on. Because of this, I found that I didn’t have much to tweet myself, but followed some of the recommendations I found on people’s library blogs (@theREALwikiman, @Philbradley etc) and some institutions and organisations (CILIP, the British Library). 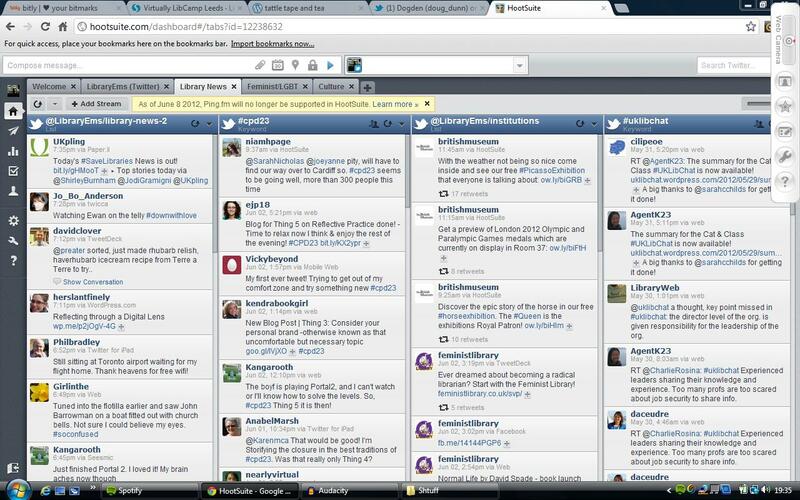 I used Twitter as a useful source of library news, job adverts and conference recommendations. Here is my Twitter profile now. As you can see, I do tweet a little bit more now, and not always about libraries. I do try and keep it less daily-life driven than my Facebook though! I have managed to build up 128 followers, which seems like a fair amount, although some other library tweeters have a following of thousands! I found the best way to find people to follow has been through attending conferences such as Libcamp Brunel and the more recent CILIP New Professionals Day. I like the way you can search by the hashtag for an event and find who is attending, and what people are saying about it. It’s also useful if you can’t actually make it to an event, but want to find out what’s going on anyway. Here I was going to link to a really interesting blog post I read about the unwritten rules and societal codes of Twitter, but I’ve just spent ten minutes looking for it and I can’t find it anywhere, or remember who wrote it or where I first saw it! I feel that this is actually a good lesson, as it shows I need to start saving interesting links and tweets somewhere I can easily put my hands on them. I shall make that my task to take away from this week, but if any one else knows which post I mean, a link to it would be appreciated! In the meantime, here is a useful Twitter advice post that I can remember. From reading other people’s CPD23 blogs about Twitter, it is clear that the best advice is that you can’t possibly read all of the tweets all of the time. And to be honest, you really don’t need to. I would say that even the most high profile tweeters that I follow only devote about 50% of their time to useful library related things – there are a lot of conversations about lunch, about knitting, about running and generally normal human stuff that I don’t have to pay a huge amount of attention to (except if it’s nearly lunchtime, and then it makes me hungry). That’s where I find hashtags and retweets really useful – if something is important, it will probably be retweeted, and if I want an overview of what people are saying about #cpd23 or #uklibchat or #cilipnpd12, I can just search the hashtag when I get back from work. I’ve heard lots of people recommend Hootsuite and Tweetdeck as a good way of managing your Twitter feed, so I set up a Hootsuite account as part of my work for Thing 4. A bewildering array of lists! I set up different tabs reflecting my different interests – one for libraries, one for feminism/LGBT related news, and one about general cultural happenings. The screenshot is the Libraries tab; I’ve organised some of the most informative library tweeters into one list and some institutions into another. Then I’ve run searches for the hashtag #cpd23 and #uklibchat for the other two lists. I think the hashtag generated ones work best – unfortunately, and through no fault of their own, my useful library tweeters all know each other and therefore all you really get on that list are conversations that they are having among themselves! Hootsuite looks very impressive, and I like the idea of different lists. However, for the moment I think I prefer the simplicity of the main Twitter feed – so many lists make me stressed! I shall come back to it if I find Twitter getting too unwieldy in future though. I have to admit that RSS was always a bit of a mystery to me, so I ignored it. Happily, I’ve discovered that it’s actually simple and useful – I’ve set up a Google Reader account and used it to follow lots of blogs. It’s great to have them all in one place and to be alerted whenever a new post comes up. I don’t think I would be able to follow as many blogs if I didn’t use Google Reader. It’s also useful to be able to sort the blogs you follow into groups – and I may have alphebetized them within the groups in a nerdy librarian way. Storify is a new discovery for me, and I really like it! I love the drag-and-drop simplicity of it, and I think it might be a useful way of saving all the tweets and blog posts about a specific topic, as well as creating pretty ‘stories’ for other people. I particularly like the way you can add your own ‘narration’ in between the boxes you’ve pulled in from other social media platforms. Annie created some excellent stories about the talks at CILIP New Professionals day, which summed up the talks and other people’s opinions of them. Here is her Storify of Phil Bradley’s talk. YiWen has also created an interesting Storify for her CPD23 post about the Glasgow Women’s Library – an institution I’d love to visit some day! I don’t feel I really have anything particularly useful to make a story about yet, but as I wanted to get to grips with the tool, I made one about LibCamp Leeds – an event that I sadly couldn’t make it to, but which I read about on Twitter. I hope I can look back at it and find it useful in future. Here it is, for your general edification – my next task is to work out how to embed Storify in my blog, as I see some people have. So much to learn! I have just read an article in the paper about the new Wifi provision in some London tube stations, where the writer enthusiastically claimed that this was so you could ‘tweet your journey’ if you so wished. Now, I may be missing something here, but one thing we surely don’t want to read are people’s tweets about their daily commutes! Stick to libraries (and lunch) folks, and we’ll all be happy ;-).